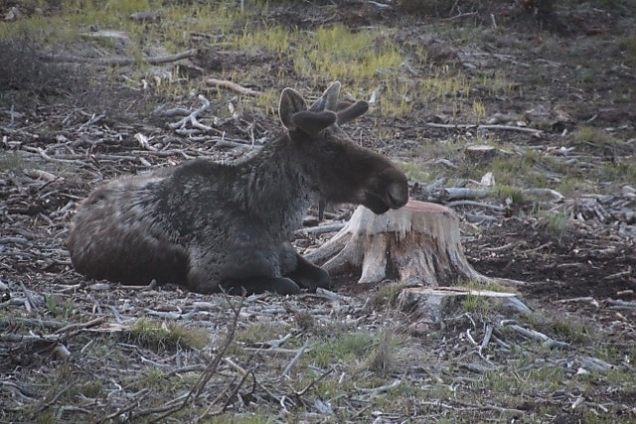 Moose Overload: or Honey, There’s a Moose Taking a Nap in our Meadow! Our evening last night started out normal enough. We grilled hamburgers and I made potato salad. Both were delicious. We sat down to watch one of our favorite reality TV shows "The Little Couple" and were about halfway through when I got up to get something. Maybe it was dessert, I don't know. 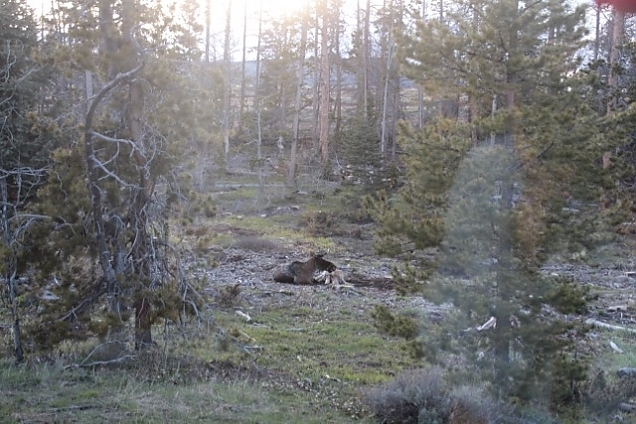 Anyway, I glanced out the dining room window (aka The Cabin TV Channel). I looked to the right and saw nothing. I looked to the left and saw the image above. What the? Here is a photo without zooming in taken from the window to show how close he was to the cabin. Sorry for the reflections but it's not supposed to be a great photo, it's just to show what we saw when we looked out. 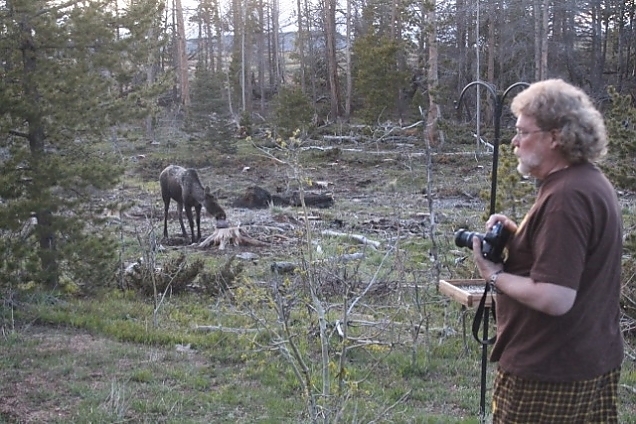 I yelled to Rick honey, there'sa moose taking a nap in our meadow! After a bit he stood up. Not afraid, just curious. He could hear our voices. 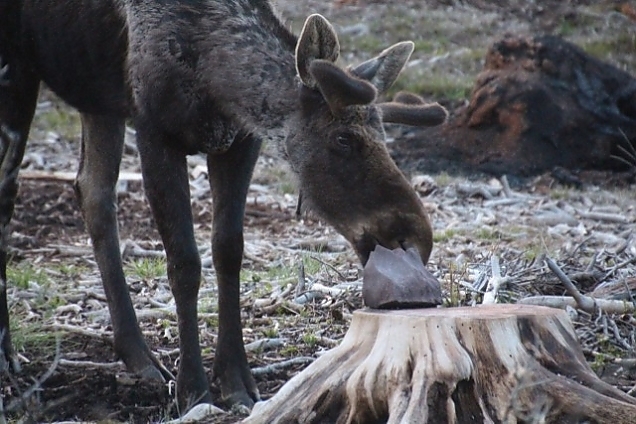 Unperturbed, he walked over to the mineral lick and started licking. Rick has some great video and you can view it following this link. After a bit we decided to try going outside to get some photos. Again, he could have cared less and just carried on with his mineral lick. We stood outside for quite a while and I even sat outside on the step and just communed with him for quite some time. It was one of the coolest experiences we've had yet. I know he looks a bit ragged but I think he's just shedding his winter coat. His antlers are just coming in. 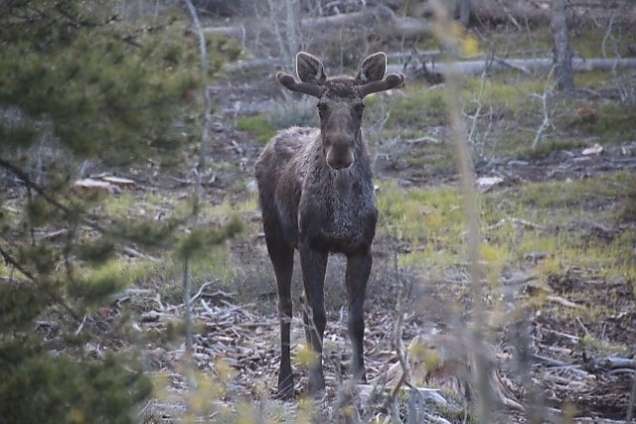 I'm not sure if it's the same moose that visited last fall, but it might be. He seems very comfortable with his surroundings. Even with us! 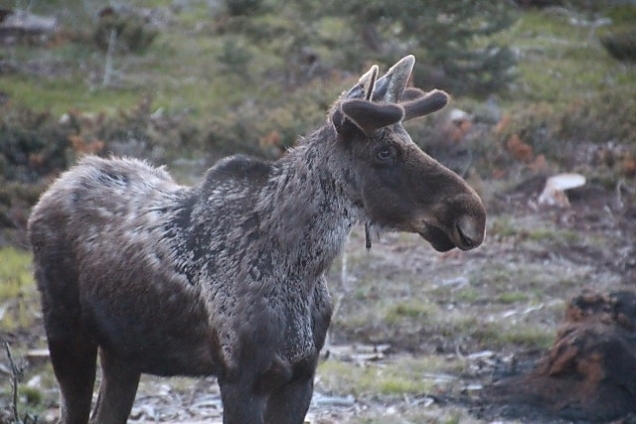 Now, it's not smart to get too close to a moose as they can cover more than ground than you possibly can, but he seemed not to mind and we took it very carefully.